Content marketing, especially in the legal industry, can be difficult to get right. In traditional practice models, it can take some trial and error to get it right. Remember though, the overall objective with content is to make it compelling and engaging so that your audience actually consumes it. For law firms in particular, there are a myriad of considerations around messaging and voice and tone as well as ethical considerations about how you approach your marketing. The good news is, there are more options for law firms now than ever in terms of approaches to content marketing, but it still requires a good deal of work to deliver on the quality. As mentioned in previous posts, we have written about the other secret ingredient: consistency. 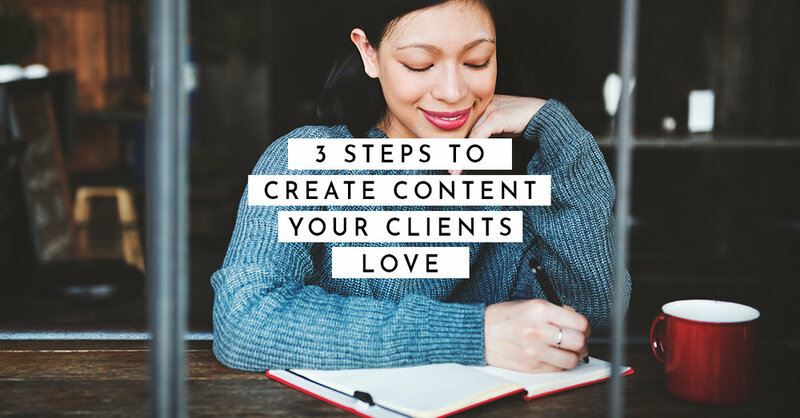 So how do you create content that your clients will love? 1. Make it for them, not you. When you are actively creating and disseminating content that applies to your client’s lives, and not just your business, they start to think of you as an industry leader, not just another law firm. Before getting started with your content strategy, one of the most important questions you need to ask yourself is: who is this for and will they find value in it? Remember, it’s not about you or your firm. It's about that client out there that you haven’t yet engaged with. This type of client centric content is key to a successful content strategy. Clients love brands and content that reflect who they are and identifies their problems or wants clearly. You want your audience to have the feeling that the piece of content was made and designed just for them or the issue/problem you can help them with. The other thing that is essential to build you brand is to be consistent so you become synonymous with the content that they are seeing in their feed. Try to think about the type of content you would connect with if you were in their shoes. For example, think about what a prospective client would need or want to see if they were looking out for a criminal or family lawyers. This is one of the most difficult issues to contend with, especially for law firms trying to stand out, whilst also operating in a saturated market. The flip side that most firms don’t pick up on is just how homogeneous most law firm copy and advertising currently is. This means its not actually that hard to stand out if you take a different, more creative approach. A great example of doing something different is creating a podcast to deliver content instead of another tired old PDF document. Another way to stand out is by creating an Instagram page that provides deeper and more engaging insights into your business, people, culture and specific services. This type of media connects with people, and most law firms are simply not capitalising on the power of social media. The reality is, it’s where your clients are spending majority of their time. Once your content channels are up and running, you want to back it up and deliver it consistently. If you take a half-pregnant approach to things and take the stop-start approach, it will be noticed and will also have an impact on your growth and following. Your readers should, for example, expect to receive a newsletter on a monthly basis. This is arguably more important than the size of the newsletter or its aesthetic appeal. Consistency is important in helping build trust with readers. The more you roll out, the quicker they will get to know you. More importantly, they will come to rely and count on you delivering your insights each month. Consistency feeds into establishing your brand as an industry leader.